The first step in going to college is to apply! For most students, applying to college can be a daunting task, but it can be particularly overwhelming for students who may be the first in their family to pursue postsecondary educational dreams or have yet to consider their plans after high school. Apply Kansas gives seniors time and space to work on their post high school plans during the school day early in their senior year among their peers and with help, guidance, and a cheering squad from school staff, local community supporters, and post-secondary educational staff members. 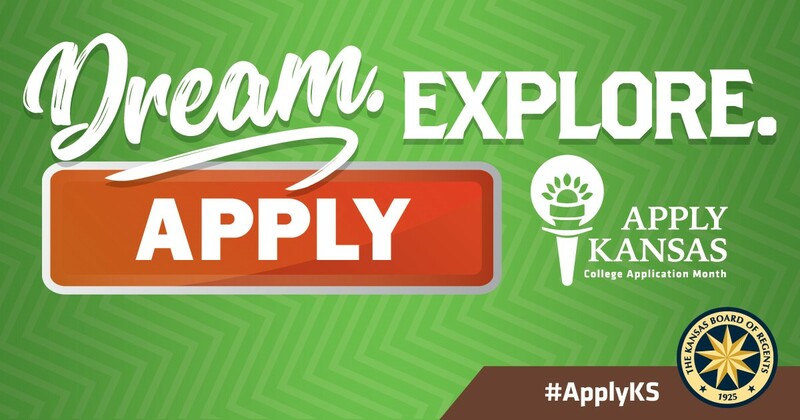 Apply Kansas: College Application Month is a state-wide initiative in partnership with the American College Application Campaign. The goal of Apply Kansas is to ensure that 60 percent of Kansas residents have a college degree or credential by 2020. Become a Site Coordinator! If you are interested in facilitating an Apply Kansas event for your school in October 2019, the registration form will be available in spring 2019. If you wish to host in October 2018 please contact April Cozine directly. We will provide training, resources and tips along the way to help you host a successful event! Check out a video about the event!